TURN UP! Are you ready for another Complete Selection Modification release this year? 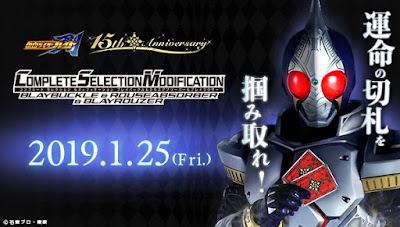 You better be as Bandai has posted a preview page for the CSM Blay Buckle from Kamen Rider Blade! To celebrate the 15th anniversary of the Kamen Rider Blade TV series, Bandai has announced that they will be releasing the 1/1 replica of the Blay Buckle, Kenzaki's transformation belt, complete with the Blayrouzer and the Rouse Absorber. It was also announced that this new offering is going to be unveiled next friday, January 25, 2019 so stay tuned for the official images, price and release date.